With a stay at Sunset Royal Beach Resort - All Inclusive in Cancun (Avenida Kukulkan), you'll be minutes from Chac Mool Beach and close to La Isla Shopping Mall. 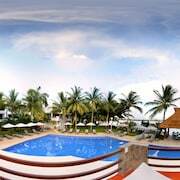 This 4-star resort is within close proximity of Forum By The Sea Mall and Cancun Golf Club at Pok Ta Pok. Make yourself at home in one of the 234 air-conditioned rooms featuring refrigerators and microwaves. Prepare your meals in the shared/communal kitchen. Flat-screen televisions with cable programming provide entertainment, while complimentary wireless Internet access keeps you connected. Private bathrooms with showers feature hair dryers and bathrobes. Pamper yourself with a visit to the spa, which offers massages, body treatments, and facials. You can take advantage of recreational amenities such as an outdoor pool and a fitness center. This resort also features complimentary wireless Internet access, concierge services, and babysitting/childcare (surcharge). Grab a bite at one of the resort's 4 restaurants, or stay in and take advantage of room service (during limited hours). Relax with a refreshing drink from a poolside bar or one of the 4 bars/lounges. A complimentary full breakfast is included. Featured amenities include a computer station, dry cleaning/laundry services, and a 24-hour front desk. Free self parking is available onsite.